American Paint Horse with a very pronounced depigmentation phenotype. In addition to being homozygous for the MITFprom1 allele, it also carries a private allele at the KIT gene (p.H40Q), which may enhance the depigmentation phenotype. The functional significance of the p.H40Q variant is unclear at the moment. International researchers have found gene mutations responsible for the so-called splashed white coat pattern in horses. Scientists from Switzerland, Australia, the United States, Germany, Iceland and Japan studied horses from various breeds and identified one mutation in the PAX3 gene and two mutations in the MITF gene as being responsible for the splashed white pattern. They said they had expected to find only one mutation responsible for the phenomenon, not three. A third mutation in the MITF gene, which the researchers found in a single franches-montagnes horse, caused a new coat color type, termed macchiato. Similar such mutations in humans cause either Waardenburg or Tietz syndrome, both characterized by pigmentation defects and a tendency toward deafness. The researchers, whose findings have been published in the open-access journal, PLoS Genetics, said they found the molecular basis for a significant proportion of white spotting patterns that are intermediate between completely unpigmented horses and common white markings. Overo spotted horse with the EDNRBI118K allele. The overo spotting pattern is quite variable in expression and typically involves much more extensive depigmentation on the body than the splashed white pattern. However, horses with minimal expression of overo spotting can have a very similar coat color phenotype as splashed white horses. During fetal development, certain cells migrate across the entire body surface and differentiate into melanocytes, the pigment-producing cells. Alterations in this precisely regulated process can lead to white spotting patterns, the scientists said. They said white-spotting patterns in horses are a complex trait with a wide variance in marking, ranging from minimal white markings to completely white horses. The “splashed white” pattern is primarily characterized by an extremely large blaze, often accompanied by extended white markings at the lower limbs, and blue eyes. Some, but not all, splashed white horses are deaf. 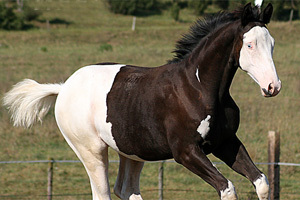 The researchers analyzed a total of 239 horses – 106 animals with the white-spotting phenomenon and 133 solid-colored controls. There were 70 horses in all with the splashed white coat and another 36 horses with more extreme white spotting patterns. They comprised 77 quarter horse or American paint horses, one hanoverian, 11 Icelandic horses, one miniature horse, two oldenburgers, one shetland pony, eight thoroughbreds and five trakehners. A Trakehner horse homozygous for the MITFprom1 allele. The 133 solid-colored controls consisted of 21 quarter horses, an American standardbred, 96 franches-montagnes horses, a haflinger, four Icelandic horses, 7 noriker, a trakehner, and two European warmblood horses. The genetic analysis was performed on either blood or hair root samples from all horses. The horses analyzed included a quarter horse family segregating for the splashed white coat color. Research into that family set the scientists on a path that not only identified the mutation in the PAX3 gene, but also two in the MITF gene. The MITF variations were present not only in some splashed white quarter horses from the studied family, but also in splashed white horses from other horse breeds. The researchers said coat color is a well-studied model trait for geneticists. Variations are relatively easy to record, which aids their analysis. Quarter Horse with the rare MITFC280Sfs*20 allele. This horse has a very pronounced splashed white phenotype with blue eyes and a largely unpigmented head and belly. In mammals, melanocytes cover the entire body surface and are responsible for pigmentation of skin, hairs, and eyes. Their development in fetuses requires a delicate level of regulation to ensure that the correct amount of cells reaches their final destination. An over-proliferation of cells that have left their surrounding tissue might have fatal consequences for the developing fetus. If, however, too few of the migrating melanoblasts, from which they develop, survive, this will lead to a partially or completely unpigmented coat. Domestic animals with such unpigmented coats have been highly valued due to their striking appearance and have often been actively selected in animal breeding. Consequently, modern domestic animals provide a large repertoire of mutations affecting coat colour. The researchers noted the complexity of white spotting from a genetic viewpoint, with its expression ranging from tiny white spots at the extremities of the body to large unpigmented areas, in symmetrical or asymmetrical patterns, up to completely unpigmented animals. Such variation, they found, could be caused by different mutations among those identified, even within closely related horses. Within the quarter horse family studied, they described six different expressions of the mutations. For example, a splashed white bay horse had unpigmented areas that were relatively small, but the horse had blue eyes; another case was a chestnut horse that had blue eyes. Macchiato coat color phenotype in a Franches-Montagnes stallion. The horse with the color called Macchiato was found in a colt born in 2008 from two solid-colored bay franches-montagnes parents. It was a colt with a striking white-spotting coat color that resembled a combination of white-spotting and coat color dilution. Investigation pointed to the coat color of the colt being the result of a spontaneous de novo mutation and the researchers subsequently termed it “macchiato”. In 2010, they performed a detailed clinical and spermatological examination, which revealed that the two-year-old macchiato stallion was deaf and had a low progressive sperm motility. The researchers said their findings would be relevant to horse breeders. The MITF mutation is at least several hundred years old, is relatively common, and occurs in several modern horse breeds. The PAX3 mutation is only 24 years old and occurs exclusively in paint and quarter horses. They did not find any horse that carried the PAX3 gene from both parents (homozygous) and, based on data from mice, it is unlikely that such a horse would be viable, with death of the embryo or foetus resulting. They cautioned against the mating of two heterozygous horses with the PAX3 mutation to avoid accidental production of an embryo homozygous for the trait. Phenotypes of splashed white horses from a Quarter Horse family. The expression of the phenotype is quite variable. Splashed white may be caused by different mutations, even within closely related horses. (A) Splashed white bay horse. The unpigmented areas are relatively small, but the horse has blue eyes. (B) Typical expression of the splashed white phenotype in a chestnut horse with blue eyes. (C) A splashed white chestnut horse with normal eye color and a relatively small blaze. (D) Splashed white coat color and brown eyes in a chestnut horse. (E, F) Two horses carrying both the PAX3C70Y and MITFprom1 alleles with typical splashed white phenotypes. Horses carrying one copy of either PAX3C70Y and/orMITFprom1 show overlapping phenotypes. None of the horses in this figure carry theEDNRBI118K (overo) allele. (B): This Quarter Horse is also homozygous for the MITFprom1 allele, but has substantially more residual pigmentation than the second horse shown in this article. (D) A completely white horse with multiple splashed white alleles. (F) A compound heterozygote for two different MITF mutant alleles is completely white. Neither these three, nor the paint horse above, or the trakehner or quarter horse mare carry the EDNRBI118K (overo) allele. Miniature horse. He is all white with an almost perfect block style re v on his forehead. There is a pic of him on the website under showing and foals. His name is WALBON Victory. Does he fall under this catagory?